Grapefruits are an 18th-century hybrid of the orange and pummelo—a large, coarse fruit mostly found in Middle and Far Eastern cuisines. Grapefruits may have white flesh, pink or ruby flesh and can typically be found year-long in most grocery stores. Often associated with dieting and weight loss, this tart fruit has many uses and can provide health benefits when included in almost any healthy meal plan. Grapefruits are one of the lower carbohydrate containing fruits, half of a medium grapefruit contains fewer carbohydrates and sugar than a typical serving of fruit. There are about 13 grams of carbohydrate in a half grapefruit. Most of that comes from naturally-occurring sugar. The glycemic load of a half grapefruit (without any added sugar or honey) is estimated to be four. There is almost no fat in grapefruit. There is less than one gram of protein in a half grapefruit. Grapefruit is an excellent source of vitamin C, providing nearly 64 percent of your daily needs in a single serving. The fruit is also an excellent source of vitamin A. You'll also benefit from small amounts of certain minerals in grapefruit, including potassium, calcium, and magnesium. Grapefruits health benefits come from the vitamin C they provide. Vitamin C is important for wound healing and iron absorption. Pink grapefruit also contains the antioxidant lycopene, which gives it its beautiful pink hue. Studies have suggested that there is less risk of prostate cancer in people who eat diets rich in lycopene. 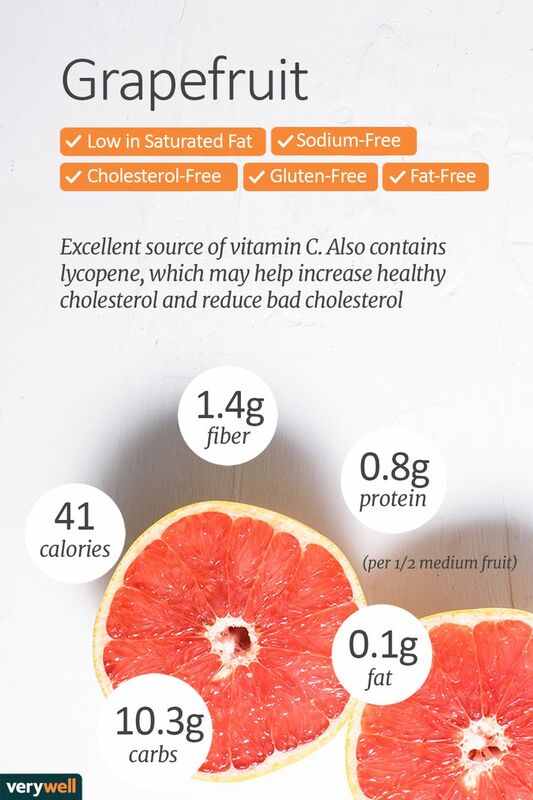 Additionally, lycopene may increase HDL (healthy cholesterol) and reduce LDL (bad cholesterol), this may be why some research shows that eating grapefruit can help lower LDL cholesterol in the blood. Grapefruits contain flavanones, a subclass of flavonoids. Flavonoids have been shown to exhibit anti-inflammatory, anti-thrombogenic, antidiabetic, anticancer, and neuroprotective activities through different mechanisms of action in vitro and in animal models. Do different varieties of grapefruit have different calories? You might see pink, white, or ruby red grapefruits available in the supermarket. The nutrition profiles between the different varieties are fairly similar in calories and macronutrients. There may be variations in antioxidant load based on color. Can you eat the skin of a grapefruit? The grapefruit peel can be consumed and also contain fiber and other nutrients. What is the best way to choose grapefruit? When shopping, look for grapefruit that has no green color left on the outside. Avoid fruit that has soft spots, or soggy areas. Skip grapefruits that have rough or wrinkled skin. Hold the grapefruit in your hand, it should feel heavier than it looks, a phrase often referred to as "heavier than it's size." This means that the grapefruit will be juicy. How should I store grapefruit? If you plan on eating grapefruit right away, leave them out at room temperature. It is believed that grapefruit antioxidant content increases as they ripen, so eating a ripe one is ideal. Grapefruit that is left to be eaten at a later time can be stored in the refrigerator. Do I need to wash grapefruit if I am not eating the skin? Be sure to wash the skins of grapefruit before consumption as it can have some bacteria on the outside. Simply rinse with cold water and brush the outside with a vegetable brush. Is there a taste difference between grapefruit varieties? White grapefruits produce the finest juice and pink fruits are sweeter. Try both and see which variety you like better. If you're going for grapefruit as a snack, pair with a protein or fiber-rich choices like yogurt or a small handful of nuts in order to make your snack more filling. Simply dig into your grapefruit with a spoon or use this fruit to add flavor, texture, and color to healthy recipes. Pair grapefruit with avocado and greens for a refreshing citrus salad, or chop up some grapefruit to make a sweet, tart relish for meats. Many recipes with grapefruit, marry the beautiful heart-healthy avocado, with ruby-red grapefruit. The marriage is not only beautiful to look at, but it is also incredibly tasty. The creaminess of the avocado mixes perfectly with the sweet, sour flavor of the grapefruit. Give these recipes a try. You've probably heard before that you should avoid eating grapefruit if you are on lipid lowering (cholesterol lowering) medications called statins. In addition to having interactions with statins, eating grapefruits and drinking grapefruit juice can interact with numerous other medications, both prescription and over-the-counter. Grapefruit contains a class of compounds called furanocoumarins, which act in the body to alter the characteristics of certain types of medications. Grapefruit may also be contraindicated with medications such as antihistamines, blood pressure drugs, thyroid replacement drugs, birth control, stomach acid-blocking drugs, and the cough suppressant dextromethorphan. Ingesting grapefruit with these medications can cause the body to metabolize these medicines abnormally. If you have any concerns, discuss your medicines with your doctor before consuming grapefruit. Grapefruit allergies are also possible. If you have an allergy to citrus you should avoid grapefruit. Begun, R. 5 Common Food-Drug Interactions. American Academy of Nutrition and Dietetics. 2014. Labensky, SR, Hause, AM. On Cooking: A Textbook of Culinary Fundamentals. 3rd ed. Upper Saddle River, NJ: Prentice Hall, 2003: 803-804.